Good morning! Let's hope the forecast is lying because it's calling for afternoon showers...that's no good because my kickball league should be starting up tonight. Anyhow, for today I bring you a spot for Dickies. The agency behind this spot is Goodby, Silverstein & Partners, and it's looking to showcase the 874 Work Pant. 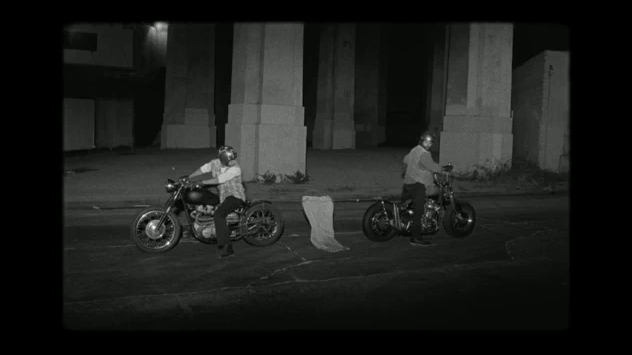 The spot features two motorcycles pulling the 874 Work Pant from each end. As you might have guessed, the spot is trying to convey the durability of the 874 Work Pant but at the same time trying to illustrate the toughness of the Dickies brand. This particular campaign has a series of web films that all put the classic 874 Work Pant through a variety of tests. A very vintage looking ad and I kind of liked it. Not too much going on but at the same time showing us something simple in a rather unique way. Anyways, I'd like to know what you thought, so remember to leave a comment below! I like the gritty, vintage, 1950s look and feel. The camera has caught every line and wrinkle of the men's faces (which is v 2000s, not 1950s). I'm not liking the out-of-focus shots. But ... what's the ad trying to tell me? I mean, is it trying to tell me the sewing of the pants is really, really tough? Because, well, the pants rip. So that can't be the point, can it? I think the message has been lost in the imagery. In trying to be visually gritty, the ad men have instead missed the mark story-wise. Ripping a pair of pants via motorcycle by no means "Earns them" -- either the pants or the motorcycle. Am I missing something, guys? I really liked the vintage look this agency approached this spot with. But then again, I asked the same question myself...the pants ripped at the end, so...what did that prove. I understand it might portray your brand as mach or tough or even long lasting but at the end of the day they ripped which as result leave you with no pants. I agree...they got too caught up in the art appeal and lost the message somewhere in there.